I’m a little out of order as I’m still reading my number 7 book, Bram Stoker’s Dracula but I only read that at bedtime so it’s taking a while. 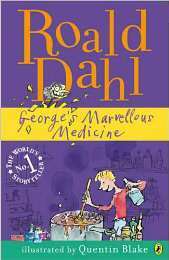 The 8th book I’ve just read is one KayCee asked for; George’s Marvellous Medicine by Roald Dahl. Both KayCee and Ella loved it and laughed out loud in places, especially when Grandma shot into the air after having her first dose of the medicine. Roald Dahl stories are brilliant. Charlie and the Chocolate factory was one of my favourite books as a child and I’m loving that the girls are wanting me to read them to them. Listography – 5 favourite recipe books. I can't believe how fast we're getting through them! We'll be finished with The Twits tomorrow; they keep pestering for just one more chapter each time we come to the end of one and they're enjoying the story so much I can't say no!